Here's the deal. You can be the music detective, deduce what kind of music Red Spektor plays. You have two clues: the album art and band picture. Take a moment before carrying on. Wait. I've already told you in the above description. Yup. England's Red Spektor party like it's 1970, maybe even a little earlier. 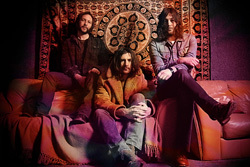 This power trio plays classic fuzzed out hard rock fuzed with blues and psychedelic rock, suitable for a stoner's turntable or your next kegger. To be honest Red Spektor is not re-inventing the wheel, but they are largely quite good at what they do even if they aren't all that original. 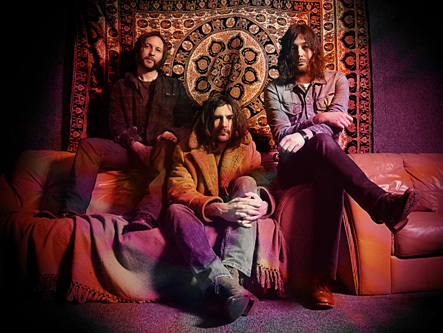 The five songs within this EP have the requisite sharp and distorted riffs, and then burn out into a combination of blues and psych jams. Underneath, the rhythm sections powers things along; the bass line is steady, the drums at times flailing. Guitarist John Scane's vocals have the appropriate tone, somewhere between stoner lazy and psych hop shop groovy. Again, it's the proper mix. It rocks, it grooves, it psyches you out. Mission accomplished. If you dig this sound, then Red Spektor is spot on and you should buy this album. 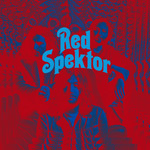 If you dig classic fuzzed out hard rock fuzed with blues and psychedelic rock, suitable for a stoner's turntable, then Red Spektor is spot on and you should buy this album.